At Campion Walker Landscapes, we believe that design does not exist in a vacuum. The landscapes and gardens we’re privileged to design and install are opportunities for us to connect people to nature, and we draw inspiration for this from the simplest forms of the earth: elements. Simple but thoughtful, here is a look at how we think about these building blocks of our natural world, and how we bring them into our considered designs. This precious resource is our favorite element: in fact, you can find water in almost every Campion Walker Landscapes installation. We celebrate water by designing understated features that incorporate it gracefully into gardens large and small. Although we love it in any form, our personal interpretation of it is less of a dramatic cascade and more about water’s subtlety; a meditative reflecting pool, a naturalistic pond, a narrow rill or runnel as an accent in a planted landscape. We see water as a delicate sound screen, a quiet destination, and always an opportunity to anchor a design with a soothing homage to the element. A small fire bowl brings warmth to a patio in our client’s home in Rustic Canyon. The most volatile of elements, and the one that must be captured and contained with the most care, fire has the power to create community in outdoor spaces. Fire pits provide designated gathering areas by appealing to a longstanding human respect and dependence on the element-- for thousands of years, we’ve congregated around flames. In the present day, a fire feature can make an outdoor space come alive after sunset, making it enjoyable and usable in a significant way. From outdoor fireplaces to minimalist cor-ten steel rings, we often incorporate fire into our designs. 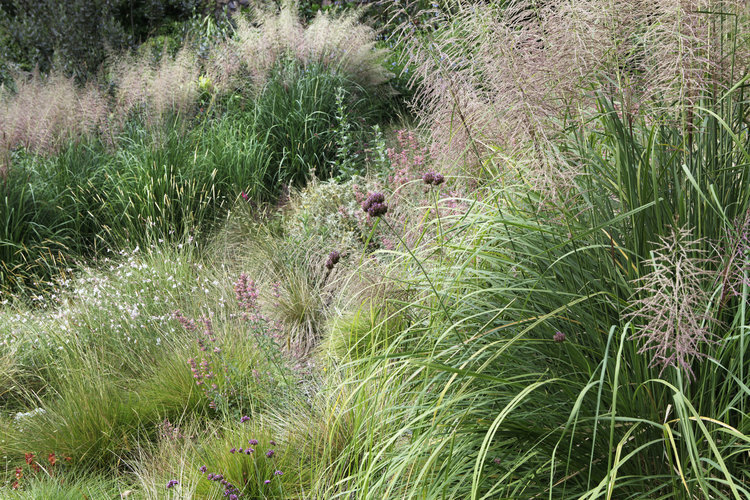 Soft grasses create a meadow to showcase soft breezes at our client’s Topanga Canyon home. Subtle yet ever present, graceful but sometimes fearsome, air is everywhere and nowhere in a garden. Campion Walker Landscapes recognizes the invisible element by designing opportunities for it to make itself known. Most often, this is seen in our planting designing. Swaths of grasses will move with a breeze, delicate tree foliage will rustle with it-- wind makes air known, and soft-featured plantings are a blank canvas for air to play on, bringing life and dimension to a landscape tableau. Natural, cut stones integrate into the landscape in an organic way in a way that poured concrete can’t match. It’s no surprise that a landscape design studio should wax poetic about the beauty of earth, the element that everything we celebrate grows from. But the way in which Campion Walker Landscapes commemorates this particular element is humble: we advocate and educate about the health of soil and its importance in a beautiful garden. By planning palettes of sustainable plant communities whose life cycles enrich the soil they are planted in, we are able to be stewards of the earth element in a deeply appreciative way. Of course, this is not visible on the surface, except in the vitality of a garden, so we bring in a visual representation of the Earth element through incorporating natural stone where possible. 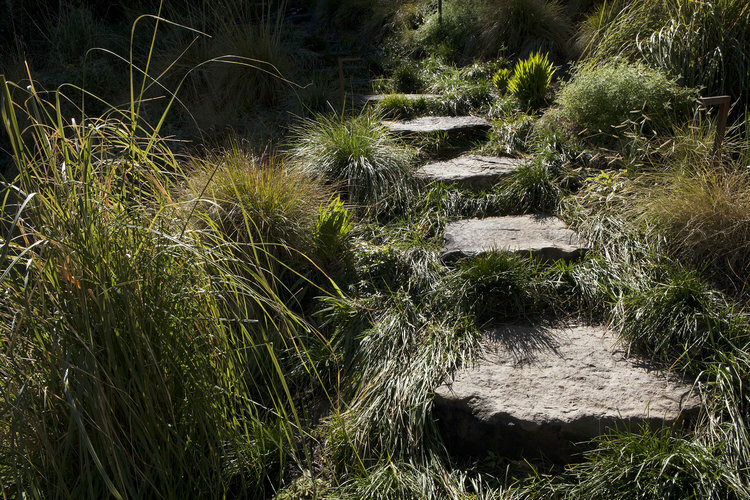 Split face boulders are our signature, which are beautiful re-uses of massive rocks, split on site to create steps, and paths-- symbols of how this element makes a garden possible. The bark of a Quercus suber tree is a beautiful texture, almost a still life of nature in progress. Wood receives an honorary place on our list-- it’s not regarded as one of the four cardinal elements, but as designers that use nature’s palette, we would be remiss to not celebrate it. More than any other element, wood reveals cycles. Those cycles can be seasonal, like a deciduous tree dropping its leaves in late Fall, or related to a life cycle, such as an unfinished wood bench aging in a rustic-modern garden setting. Wood, and the trees it comes from, represent the simplest building material man has to make his place in nature.